In Part 1 , we have create two container views, linked outlet to their leading constraints and implemented the toggling function. In this part, we will implement the pan gesture to show / hide menu and segue to profile view controller when user tap on the tableview row. This post assume that you already knew about Auto Layout and Delegate. As the side menu will move according to the distance we swiped in the app, we will create a Pan Gesture recognizer to capture the movement of finger on the ContentViewController (which every view controllers in tab bar are subclassed from, so the pan gesture will apply on each of them). When user's finger move right, the translation's X value is positive; when user's finger move left, the translation's X value is negative. When we release the drag / finger , the side menu is stuck on the last position we dragged! 😬 . When you release finger in the middle of drag on the Twitter app, it should continue to move until the menu is fully opened / closed. Next, we will add some code for this 'snap-to-nearest' feature. Build and run the app, and try to release while dragging. The side menu should snap to fully open / close position now 🤘. We have successfully added the swipe to open/close gesture for the side menu, Awesome! Next, we will add some menu to the side menu's table view, and add action to segue when it is tapped. For the segue, we will push the profile view controller to the navigation controller of the selected tab. Next, we will need to add an identifier to the profile view controller (or any other controller you want to segue to) in the Storyboard. 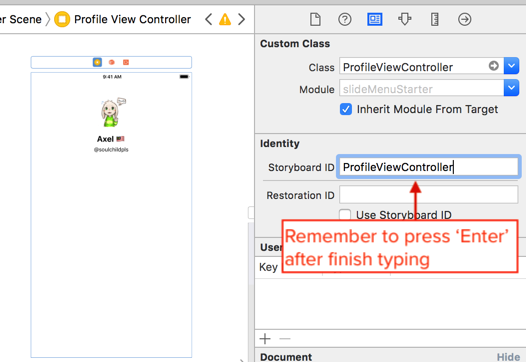 So that we can instantiate this view controller in code like this : storyboard.instantiateViewController(withIdentifier: "ProfileViewController"). except it doesn't do anything when the side menu is already hidden. Next, we will modify the toggleSideMenu(fromViewController:) function in the MainViewController. 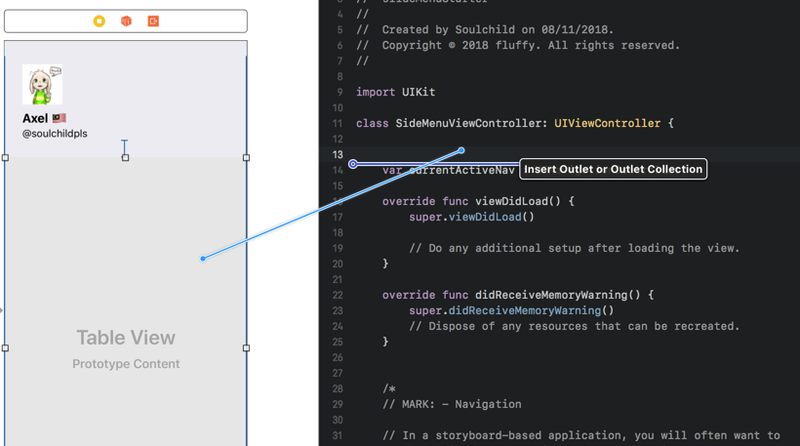 We want to set the value of currentActiveNav to the navigation controller of the selected tab when the menu is shown. We have finished preparing for the setup, next, we will setup the table view and implement the tap action in the side menu. Let's create an outlet for the table view in the side menu view controller (hold control and drag), and name it menuTableView. @IBOutlet weak var menuTableView: UITableView! You have now implemented Twitter slide menu without using any library / Cocoapods 🎉! Container views helped us a lot on implementing the slide menu, now you can use one less library when you want to implement slide menu 🙌. Want to dive in the completed project and try it out?